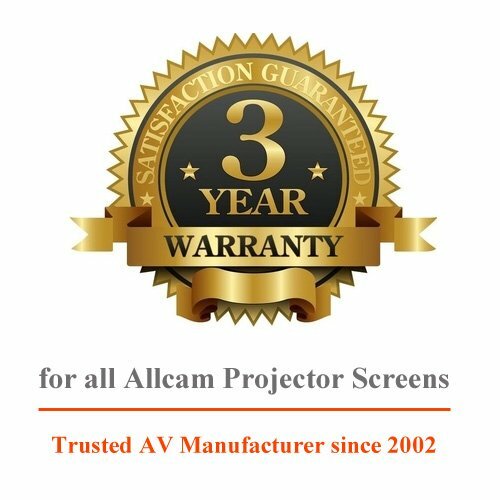 The Allcam PCW92MM is a high quality 92" projector screen in 16:9 wide screen format for the ultimate home cinema experience. The PCW92MM projection screen uses high quality matte white material which is tear resistant, fire proof, wrinkle proof and designed to hang perfectly flat. FAQ: Which type of projector screen should I purchase? A: Allcam sells the two most widely used projector screen types: Matte White and Glass Beaded. Each has its own advantages and disadvantages. Glass beaded projector screens have the ability to achieve a higher gain by reflecting more of the projected light back along the projection axis. Glass beads impregnated in the screen's surface provide additional reflectance which results in vibrant, life-like color reproduction at moderate viewing angles. Not recommended for areas where screen will be subject to abuse or soiling. Matte White is the most versatile of screen surfaces and the number one choice for situations where ambient light is controllable. It's surface evenly distributes light over a wide viewing area. Screen surface may be cleaned with mild soap and water. Matte White projector screens are flame retardant and mildew resistant. These PCW92MM projector screens come brand new in a seal box with 3 years warranty.